Sparked by reports uncovering the systematic spreading of false information on the internet to influence elections and fuelled by US President Trump’s distrust and hatred of the media, the debate over “fake news” and misinformation has been one of the most important issues of the past year. According to the Reuters Institute Digital News Report 2018, 54 per cent of global news consumers are very or extremely concerned about what is real and what is fake on the internet when it comes to news and only 44 per cent of the more than 70,000 respondents think that most news is trustworthy. However, it may not be what is often referred to as “fake news”, i.e. completely fabricated stories spread for commercial or political reasons, that hurts trust in the news media the most. 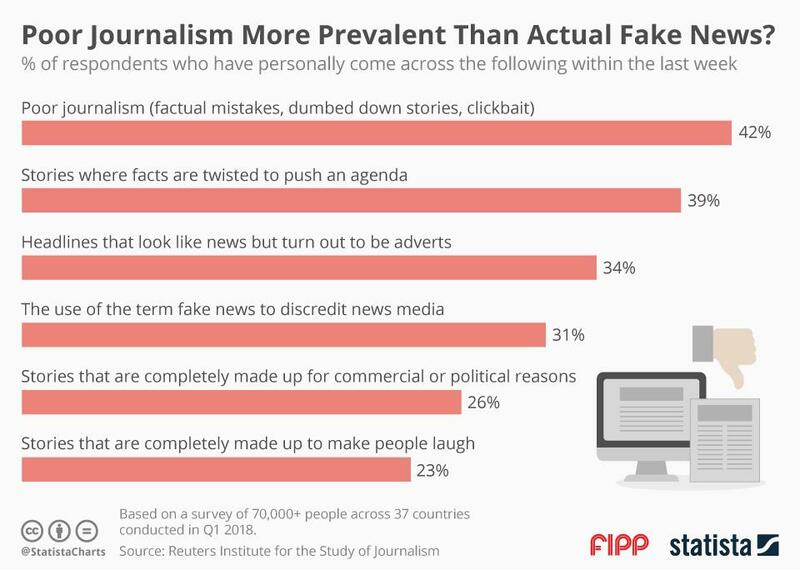 According to Reuters’ findings, poor journalism, e.g. factual mistakes, dumbed down stories or clickbait, are the most commonly perceived form of misinformation. Forty-two per cent of all respondents reported having been exposed to examples of poor journalism in the past week, while only 26 per cent had come across stories completely made up for political or commercial gain.